The Blustone tasting room sets atop a small hill on the Leelanau Peninsula. “Wow, this Michigan Pinot Noir is great,” said almost no one ever. I’ve been a booster of Michigan wines since first visiting in 2010. I have been back a couple times since then, the latest in 2015. Michigan, and particularly upper state near Traverse City is the home of world-class white wines. The Riesling wines and Pinot Blanc can be matched against any found on wine store shelves. The reds have been a different story. The Leelanau Peninsula and Old Mission Peninsula wineries struggle to grow enough grapes – get them ripe and make good Cabernet Franc and Pinot Noir. The vines are aging and the wines are improving. I noticed a big leap in the reds from 2010-2015. But those wines are also aging well. During the 2015 trip I purchased two bottles of Blustone Pinot Noir. Blustone has a great vineyard site and beautiful tasting room. Back in 2015 the wines were very light in flavor but varietally correct. I thought that was the first step to making great wine. The drawback to the Michigan reds has been the weather. There have been a couple of years recently when weather killed off the reds with late freezes and growing seasons just too cold to properly ripen the grapes. During a couple of recent growing seasons there was essentially no red grape harvest. That’s the background to opening a bottle of Blustone Pinot Oct. 21. I drank the first Bluestone within a year of that last visit. It tasted like Pinot. It was very thin and not very satisfying. The second bottle was opened last night. It had totally changed – for the better. The wine had been properly stored during the last two years. I had polished off a bottle of very well-crafted Oregon Pinot Noir and my friend and I wanted one more glass. I reached for the Blustone thinking it would be super light but good enough for my acquaintance’s inexperienced palate. I was shocked at first taste that the Pinot characteristics were more pronounced. The wine was more Burgundian than typically thin. The wine in the glass had bright red fruit like cherry and strawberry along with a wonderful hint of spice on the finish. Maybe the Michigan reds are underestimated. Maybe this was an odd exception. I have a bottle of a red blend from Old Mission Peninsula I bought on that same trip that I need to dig out and see how it’s aged. But there’s no question there is a spot in the market for Michigan Pinot Noir similar to what I tasted last night. The biggest question is whether the weather will ever allow Michigan growers to produce enough Pinot grapes to get the wines beyond the state’s tasting rooms. Thanksgiving is just days away and holiday entertaining is about to hit in a big way. In the early years of Grape Sense, I’d frequently include specific wine choices I could highly recommend. It dawned on me recently I hadn’t done that in a couple of years. Thanksgiving Wine: The first rule is really rather simple – just match the wine to the entire dinner and not just the turkey. Think about spice, bold flavors, and how your wine choice might pair up with the entire table of goodies. Specific and safe pics would be Chardonnay and Pinot Noir. Both work well with fowl and the usual side choices. If you’re feeling more adventurous look for a white Chenin Blanc or a Spanish Tempranillo red wine. A good French Rose or Oregon Rose would be another excellent pairing. Here are a few wines or types of wine I’ve been drinking lately. They were all purchased or are available in Indiana. Oliver Winery: I spent some time with Bill Oliver a few weeks ago and tasted through his Creekbend vineyard wines. Several of those wines would make outstanding Thanksgiving wine and you can brag to your guests is grown and made in Indiana. The Creekbend Vignoles is a big winner in my book. It’s soft enough for the non-wine drinker and interesting enough for the more serious wine geek. The Oliver Chambourcin is light like a Pinot Noir with good earthiness for any meal. Red Blends: There is nothing hotter in the wine world right now than red wine blends. They tend to be softer and more drinkable than many red choices. Rook Washington Red is a wine that has strong dark raspberry flavor and a smooth delivery. It’s a steal at $14.99. Go to your wine shop and look for Washington State red wine blends and you’ll seldom be disappointed with the many choices available for under $15. Of course, you get up to $20 and that’s where the quality difference becomes more pronounced. Spanish Reds: There are few categories which over-deliver like Spanish red wine. Most Spanish wines will be predominantly the native Tempranillo grape. If you think of a light mouth feel, but full flavored-wine you’ve started a good description of most Spanish wines. Spain ages its wines before release so many are ready to drink right off the shelf. Black Slate Porrera Piorat and Cogolludo Guadalajra Tempranillo-Syrah are great wines I purchased in state. If you want something really tasty go for the Tocs Priorat which is 100 percent Garnacha (or Grenache) for $20. Tasty Whites: Alsatian Pinot Blanc from France, Rousanne from France or California’s Central Coast, Stoller Estate Chardonnay from Oregon, or a Grenache Blanc from southern France would be great pics for Thanksgiving or a holiday party. These wines are meant to be crowd pleasers. The wines here should appeal to most any palate. If you have specific wine questions, don’t hesitate to write. BLOOMINGTON, In, – Any discussion of Indiana wine has to always include Oliver Winery. The iconic Hoosier winery, synonymous with sweet wines, is Indiana’s biggest player on a big stage. Oliver is one of the nation’s biggest producers not located on the West Coast. 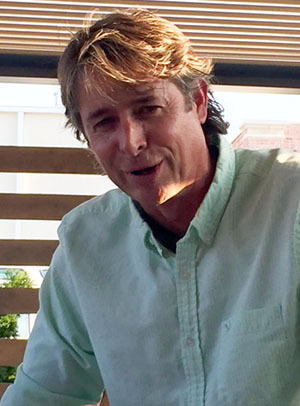 Bill Oliver, who took over from his pioneering father in the 1980s, has grown the winery and expanded the operation’s wine footprint beyond Soft Red and White wines. I spent a couple of hours Friday morning with Bill Oliver at the winery. He was cordial, excited about the future, and enthused about a new higher-end venture that might surprise a few wine purists. Oliver chatting, tasting Chambourcin in the tasting room. Anyone dismissing Oliver Winery as ‘that sweet stuff’ is missing the mark. Yes, Oliver is a leader in sweet Concord red and Niagara white wines on a regional level and perhaps a national level in the next decade. But Oliver Winery is also producing very well-made wines from its nearby Creekbend Vineyard. 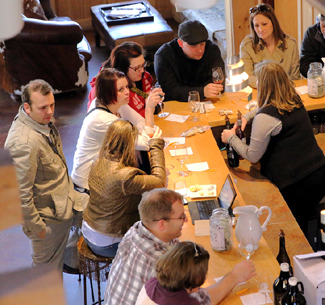 Traminette, Vignoles, Chambourcin and more are featured at wineries across the state. But few, if any, are making those wines any better than Oliver. The initial purpose of my visit was to talk to Oliver about his “Flight” series of wines featuring carefully sourced fruit from California vineyards. The current release getting lots of deserved attention is a 2013 Pinot Noir from the legendary Bien Nacido vineyard on California’s central coast. That name may not mean much to many wine drinkers but to real wine geeks Bien Nacido is one of the most sought-after vineyard designate wines in the Santa Barbara area. Bill and I tasted wines with winemaker Dennis Dunham. We tasted the 2015 which had not even made it to the barrels yet. We sipped the 2014 which has seen its time in oak and now rests in stainless steel before bottling. And we tasted the mid-summer release of the 2013. I had previously tasted the 2013 and thought it was outstanding. The 2014 is going to be even better with a more extracted fruit flavor. It’s too early to tell on the 2015 juice. The Oliver Bien Nacido Pinot sells almost exclusively in the Oliver tasting room for $45. That’s a big price jump for a winery known for the under-$10 sweet wines. But the solid Creekbend entries sell in the high-teen to mid-20s range. Oliver said one of the reasons to make the Pinot was to show people what his team could do with really great fruit. An aside for the wine geeks, buying California fruit for Hoosier-made wine is nothing new for Oliver or many others. Oliver has access to some great California Central coast fruit and scored with his catch of Bien Nacido Pinot. It’s an expensive experiment but one the winemaker and owner clearly are enjoying. At the other end of the spectrum is Oliver’s new Bubblecraft red and white wines. The $9 “fizz” is in the traditional Concord and Niagara grapes and in grocery stores already. 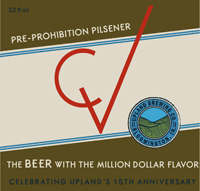 Oliver produced and expects to sell about 10,000 cases this year with an expectation of nearly 25,000 cases in sales next year. I have several story ideas from my time at Oliver today. Most of those will be posted or promoted here. There is even some bigger news coming from Bill Oliver not mentioned here. CARMEL, IN. – This affluent Indianapolis suburb certainly raises the connotation, and rightfully so, of an affluent and growing community. Its progressive Republican mayor is constantly grabbing the headlines with big ideas. Carmel conjures up a lot of images – but as a foodie destination? Indianapolis’ dining scene has claimed all the headlines in recent years but Carmel wants to step out of the big city’s shadow with its own eclectic dining options. Hamilton County’s Tourism office sponsored a foodie tour for Midwest food writers, and one wine writer Thursday evening. The tour was hosted by Small Potatoes Catering. The company not only caters but leads private foodie tours of Carmel, Indy, Mass Ave, and soon Fountain Square. I was joined by two area Chicago food writers, the Indy Star food writer, and Cincinnati’s Food Hussy. Heather, aka the Food Hussy, is one of Cincy’s top food writers and was lots of fun. It helps when your press contingent has an adventurous and congenial attitude. We made four stops Thursday night – Peace Water Winery, Divvy Restaurant, Uplands Brewery, and Chocolate for the Spirit. Most of us stayed over for breakfast at Eggshell the next morning. Each of the fives stops helped the tourism pros illustrate how unique and local can make any suburb or small town a food/beverage destination. Peace Water is certainly the most unique of Indiana’s 80 wineries. Owner Scott Burton owns a winery in California, buys his grapes from California vineyards, and employs a winemaker in California. His tasting room is in Carmel. His wines are not even sold in California. For Burton, it’s all about giving back to community after an obviously successful career as a corporate lawyer. 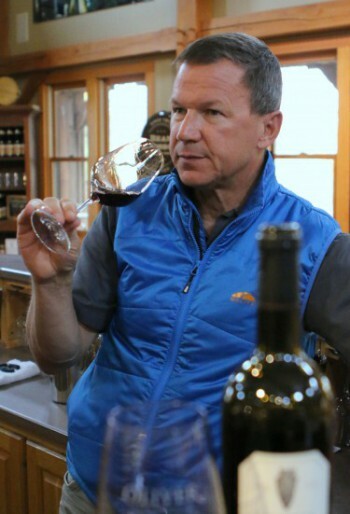 He has a unique approach to giving back – when you buy a bottle of wine in the downtown Carmel tasting room you are given a token. Then you decide which of seven charities shares in Burton’s philanthropy. The winery earmarks 50 percent of all profits to the seven charities. The wines were pretty solid too! He poured four of his several wines during our brief visit. His Sauvignon Blanc was pleasant enough, crisp, but definitely on the acidic side. A Sonoma County Rose had pronounced strawberry flavors and was an easy sipper. His red blend and Cabernet were the really quality winners for my palate. While both saw substantial time in oak, the tannins on the reds were smooth. The wine is definitely in the ‘fruit-forward’ style popular with so many consumers. His price points range $20-$40. Through his winemaker’s family winery on Howell Mountain, Burton acquires a limited amount of fruit from one of the regions considered holy grail in wine circles. His Howell Mountain cab, which we did not taste, sells for $120 for the real wine aficionado. Divvy restaurant was our second stop inside Carmel’s City Center Complex on Rangeline Road. The best way to explain the concept is the old adage “divvy it up.” The staff explained that we not think of their restaurant as “appetizer, entrée, and dessert” but that everything on the menu was an appetizer, entrée and dessert. It’s a fascinating concept that is essentially small bites as a meal. I loved the beer cheese with an assortment of breads and the bacon bites which was pork belly, maple bourbon gastrique with Applewood smoked sea salt. The porterhouse steak bites were tender and juicy. According to staff, their most popular dish is a corn crème brulee with romano, jalapenos and red sea salt. I am adverse to heat/spice and took just a small bite of the corn which was yummy. The bites range from $6 to $16. Our Small Potatoes’ staff hosts said an order for two people is usually 4-5 of the bites. Owner Woody Rider joined us briefly to talk about the restaurant. He also owns the popular Woody’s Library in downtown Carmel on Main Street. Uplands Tap House Brewery, which has several Indiana locations, was our third stop for a taste of some Hoosier brewed beer. Our hosts served up their historic Champagne Velvet and popular Dragon Fly IPA. I’m a wine guy and seldom a beer drinker but really enjoyed the Champagne Velvet. The Uplands staff soffered some creamy Mac-n-Cheese made with wheat beer. That was accompanied by one of the best, rich-tasting pulled pork sandwiches I’ve ever had. Our final stop of Thursday night was with old friend Julie Bolejack and her Carmel Chocolate for the Spirit location on Carmel Dr., just off Rangeline. Julie educated and entertained as always. She talked about the different chocolates she uses in her creations and gave us a taste of three different chocolates. 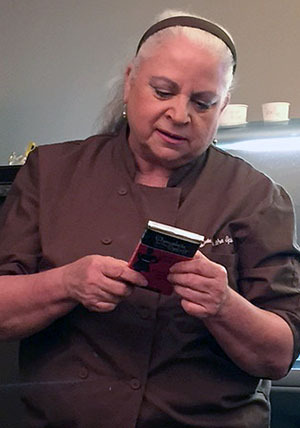 Julie has access to the world’s rarest chocolate – Pure Nacional. We toured the kitchen where Julie makes her beautiful creations and bought some take-home chocolate as well. Julie sent each of us on our way with a box of three truffles. Eggshell Bistro, also in City Center, was our Friday morning and final stop of the foodie tour. 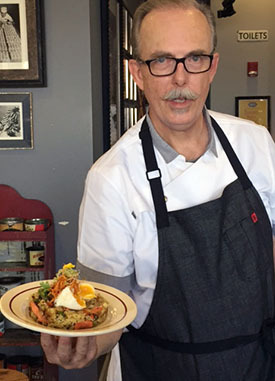 Chef Larry Hanes wowed us with his breakfast creations. Now I’ve read the word “wowed” in far too many food/restaurant reviews for years. I can honestly say this might be the first time I felt confident using the jargon. Hanes is not just a chef at all. He designed the small bistro space, picked out the art, collected numerous kitchen antiques and pieces with interesting history to stock his café. Click on the restaurant link above and go to the “About” section to read more about this remarkable man. Our brunch started with Blue Bottle coffee that was one of the best cups I’ve had in years. I have to admit that I had never heard of Blue Bottle but a couple of the food writers were quite impressed. Chef Hanes wowed us with dish after dish he served up family style so we could get a taste of many different breakfast entree’s. We had frittata’s, quiche, a Morocan inspired dish, and more. My two favorites were a rosemary/ham frittata and fish and grits with a soft boiled egg on top. This restaurant has received accolades but remains a bit of a hidden gem in my estimation. The small dining room was only half full on a Friday morning at about 10 a.m. It’s one of the most remarkable dining experiences you’ll find in the city. It should also be noted that Chef Hanes cooks everything. He is the only person in the kitchen and does it all himself. The antique equipment, art, and atmosphere are worth the drive if you’re elsewhere in the city. Don’t be in a rush at Eggshell, the service can be a bit slow based on our experience and a few Yelp reviews I read after visiting. Go anyway, Eggshell is a treasure. NOTE: I plan on writing more on a couple of these businesses. Those posts will go up in the coming week or two. We didn’t have the time on a tour to stop and interview the owners. Our hosts did provide some notes that I will use to tell you more about a couple of these businesses. And I’ll note appropriately that the material was provided. As Indiana wine quality continues to improve and get noticed around the Midwest, a few efforts have reached the pinnacle of success. River City Winery and Huber Winery won top honors with their Vignoles at the annual Indy International Wine Competition in 2012-2013. 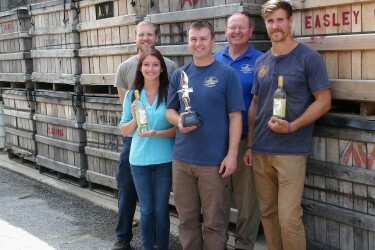 Easley Winery, in downtown Indianapolis, claimed the top prize this year with Indiana’s signature Traminette. Making a great wine starts in the vineyard and carries throughout the winemaking process. Traminette is sold by half of Indiana’s 80 wineries. And it seems every new winery in the state plants some of the signature white grape. Unfortunately, there are occasions when the grapes are made into wine and sold before they’re ready for commercial production. It’s no surprise when the very best wines come from producers like Huber and Easley. Easley explained the keys to his Traminette is controling the crop load to 5-7 tons per acres, keep the vines well drained, and make sure the fruit gets plenty of direct sunlight just before harvest. “In red wine making, we like to run the temperatures up in the high 70s and 80s for color and tannin extraction, no to sin fruit aromatic white wine make. We like to make our Traminette in a semi dry style that is food friendly. 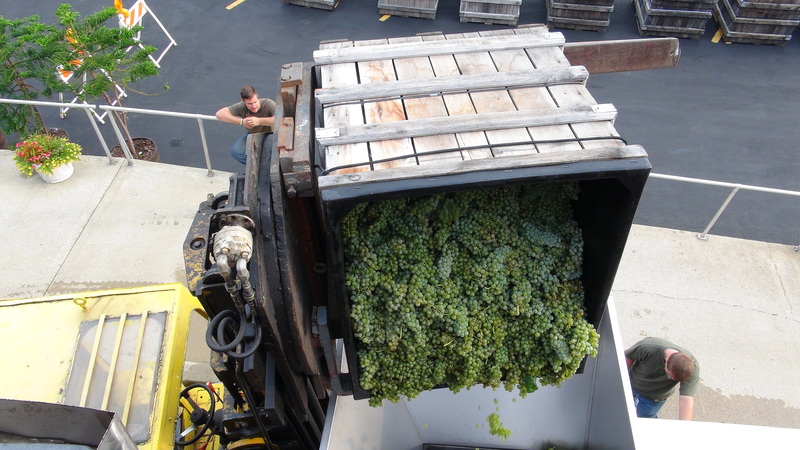 Traminette being delivered to winery in 2014. “After getting the perfect grapes from our vineyard the work begins at the winery crush pad,” the second-generation winery owner said. “We like to see four to 12 hours of cold soak for the grapes in the large boxes we pick them in. This gets the juice in contact with the sun-exposed skins. We then destem and press the grapes in bladder grape presses. The press uses very low pressure in a gentle way. The Easley Traminette is widely distributed through Meijer stores. I liked the wine a lot because it was done in a dry style. The signature floral bouquet in Easley’s wine is present without being over-powering. The wine is a great representation of what Indiana can do right. Indiana’s corn and soybean crops have sustained $475 million in rain and flood damage this summer according to Purdue University agriculture economists. Indiana’s grape crop and vineyards haven’t escaped the soggy summer woes either. The rains have hurt vineyards most in Central Indiana while southern vines have been spared. “All the rain this year has made it especially difficult to control diseases,” said Bruce Bordelon, Purdue Professor of Horticulture and specialist in commercial grape and wine production. 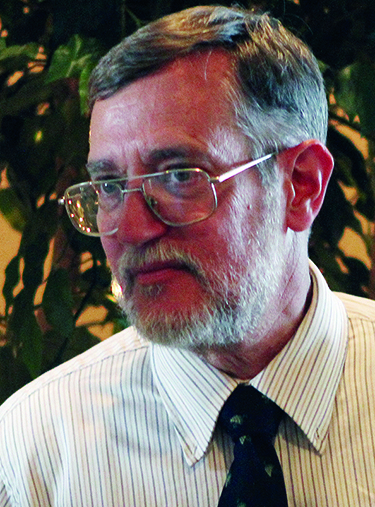 He said many vineyards avoided disease problems thanks to a dry month of May. Purdue’s grape expert said many of the problems could still be overcome with the most critical weeks of veraison (grape ripening) still ahead. Don Pampel, owner of Whyte Horse Winery near Monticello, owns one of those vineyards impacted by the downpours. “The heavy rainfall has made some of our vineyards extremely wet and holding water in the rows for extended period of time,” he said. “This has caused stress on the vines and depleted some of the nutrients that they depend on and we are having to spray nutrients where we have not had to in the past. The frequency of the rain has caused challenges to keep the vines protected from fungus that the rain spreads. A big challenge with the heavy rainfall is vineyard management. There is the obvious cost of additional spraying and loss of crop but fighting the rainfall’s effect increases labor cost. Bernie Parker, Vineyard Manager for Oliver Winery, said his crews have tried to stay ahead of the heavy rainfall by working the vines. Oliver’s Creekbend Vineyard, just north of Bloomington, is on glently rolling slopes allowing excess rainfall to run off preventing flooding. But Parker notes the heavy rains cause a proliferation of weeds to be pulled. Creekbend was one of many Indiana vineyards to take a hit in 2014 and 2013 from extremely cold winter and spring weather. But Bordelon noted new vines and retrained vines should be benefiting from the additional moisture. Parker agreed that his re-trained vines were looking strong. 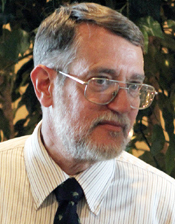 Butler said normal August weather should deliver a strong crop despite all of the early rains. Rains have been mostly normal in the Ohio River Valley region. ”In Southern Indiana we have been very lucky in missing all of the large rain events and as a result we have remained very disease free,” said Ted Huber, Huber Orchard and Winery. “Vine growth has been very good plus we continue to remain warmer and sunnier than other parts of the state. Huber has the state’s largest vineyard with more than 20 varietals planted. Just down the road at Turtle Run Winery owner Jim Pfeiffer said the rainfall had not caused any problems for his vines. Bordelon said the heavy rain and resulting challenges means some Central Indiana vineyards are likely to see a reduced harvest. A sunny and warm month of August could boost the crop as ripening gets underway. Leland’s historic Fishtown on Lake Michigan. LELAND, MI. – Charming fishing village and wine country don’t always seem to go hand in hand but this small town along Lake Michigan achieves both. 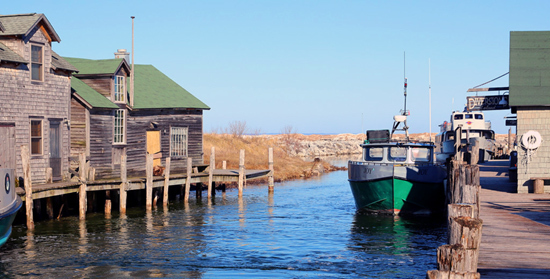 Leland has a historic fishing village still intact and a very small charming downtown. It’s more summer home to the well off and summer vacation spot than fishing village but nonetheless still worth a visit. Leland also is at the heart of Leelanau wine country. It’s my third visit to this far northwest corner of the state. I’m here as a guest of the Leelanau Northern Wine Loop. I’ll be visiting four or five wineries today and tasting the 2014 new releases. Tonight, I’ll confer with other visiting judges to pick the best of the best then join a big release party tonight at the small town’s historic Bluebird restaurant. See photo album here from my Saturday visit. Michigan wine? You’re not familiar? In short, particularly northern Michigan, produces white wines as good as any label you’ll find. Because of the short growing season, the area struggles in reaching a red wine identity. I expect to taste Pinot Noir, Cabernet Franc, and Merlot as the winemakers continue to search for a signature red. The Resiling and Pinot Blanc are outstanding usually. My intent is to add a paragraph or two here throughout the day as I make those four or five stops. I’ll try to add an iPhone pic or two along the way but will add a full album later today or in the next day or so. 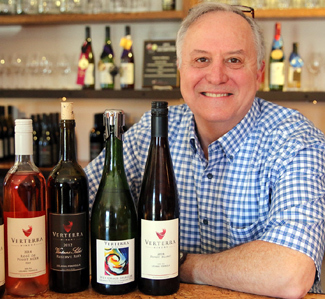 Paul Hamelin, owner of Verterra Winery in Leland, Michigan. Verterra Winery, Leland Mi. – A great start to my day tasting Paul Hamelin’s wines at Verterra Winery. His dry Rose rocks. He sold out of his 2013 – 100 percent Pinot Noir – I bought six bottles last year. The big winner today was his killer Pinot Blanc – very pronounced fruit with big acidity in a tough growing year for Northern Michigan vintners. Boathouse Vineyards, Lake Leelanau – Beautiful tasting room in a small village which – yes, indeed – looks a bit like a boathouse. Nice wines across the board. I really enjoyed the 2012 Pinot Noir. It was varietally correct, nice pinot taste – light on palate as you’d expect from cool climate red wine. But the real winner was Dry Dock Reisling, a dry and crisp citrus mouthful of goodness. This is type of white wine that puts Michigan on the map – at least for their whites. 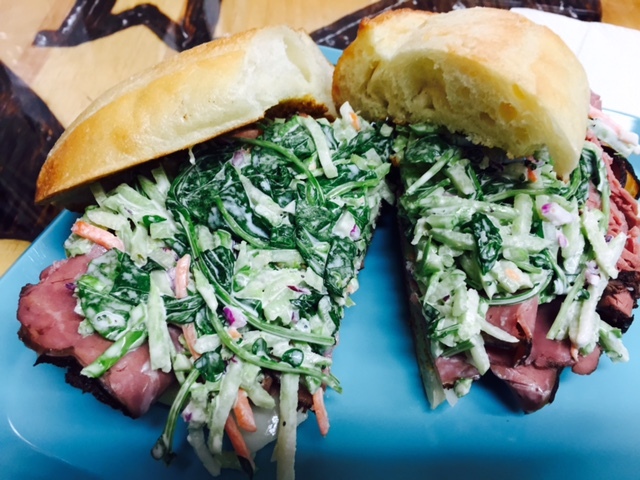 Fresh carved roast beef, swiss and a very tasty cole slaw. Next on my day’s agenda was a quick sandwich in Lake Leelanau. I’m gobbling down a very nice roastbeef, swiss cheese Sammy with great cole slaw on top at The Thunderbird. Blustone Vineyards, near Lake Leelanau – This was my second visit in two years to Blustone which is fast becoming one of my Michigan favorites. Owner Tom Knighton found a great hilltop piece of property and built a beautiful, modern tasing room in the midst of vineyard and cherry trees. Like most others, they’re white wines are great. I tasted an unreleased Pinot Blanc that was among the three best wines I tasted all day. Blustone also is at or near the top of any Pinot Noir on the Northern Loop. They’re getting there. The vines are only 10 years old and they need age. But the Pinot is varietally correct and gaining a little bit of character each year. The busy April 11 tasting room at 45 North. 45 North Vineyards – Apparently no one got hit harder from last growing season’s killer frost than 45 North. During my April 11 visit they were the only one of five stops not even pouring a red wine though there were a few on the shelves. Nonetheless, 45 did have one of the best wines I tasted all weekend and that was a Pinot Gris fermented in the now-popular cement egg. The cement egg – and that’s exactly what it looks like – gives the already outstanding wine a crazy creamy mid-palate. It’s unique and well worth the mid-$20 price point. It won’t be released until May. 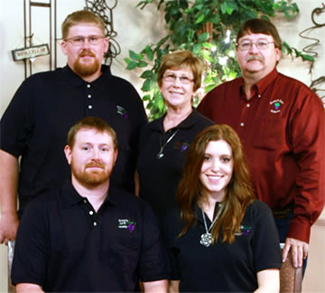 Aurora Cellars – Just up the road, literally, from 45 north is an older winery under new management. Their standout bottles were the whites with a semi-sweet Reisling best of what I tasted. They’re not afraid of cooking up some unique blends and are on to something with a mid-teen red and white sure to please the masses.